El tema "What Are You Waiting For?" interpretado por The Saturdays pertenece a su disco "Finest Selection: The Greatest Hits". La letra de la canción "What Are You Waiting For?" fue publicada el 26 de junio de 2014 con su vídeo musical. But can you handle that? Boy what you waiting for? Tell me what are you waiting for? Canción: What Are You Waiting For? 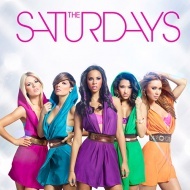 Escuchar The Saturdays What Are You Waiting For? Lyric Video.